In Mutters Schuhe Nina Roeder shows her mother’s life from three distinct perspectives: from her grandmother’s, from her mother’s and from her own. 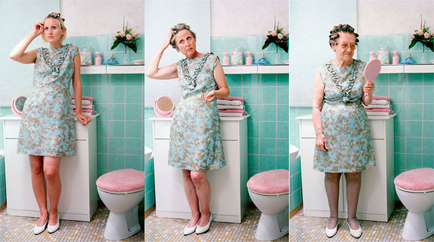 Roeder highlights self-reflective moments in her mother’s life, like her prom and her education as a hairdresser, in order to explore how subjectivity and perspective affect the retelling of memories. The photos were shot in old rooms in Roeder’s mother’s childhood home in the Franconian province. The clothes the three women are wearing are original clothes that belonged to Roeder’s mother.